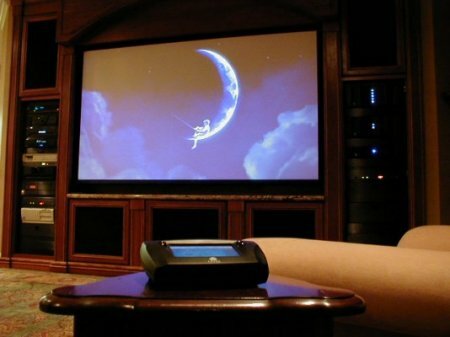 Our Definition Of A Home Theater is a room that includes a quality high definition TV and/or movie projector and screen, properly positioned speakers and subwoofers and audio and video electronics, that when combined, closely reproduce The Feeling Of A Live Sporting Event and The Thrill Of A True Cinema Experience. A small intimate space like a master bedroom sitting room for you and your partner. A comfortable medium sized family room or den shared by you and your immediate family. A larger gathering space for entertaining friends and family like a great room or home entertainment area. 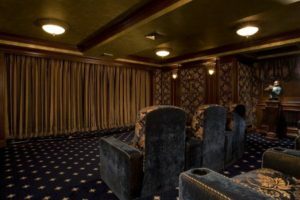 A dedicated home theater room designed and built specifically for viewing sporting events, movies and gaming and usually located in a lower level area, attic space or bonus room. We will help you accomplish this by measuring the distance between the video display and your favorite viewing area. Once this distance has been calculated we will refer to the guidelines established by organizations like The Society of Motion Picture and Television Engineers to recommend the correct screen size and picture quality necessary to recreate the desired Visual Home Theater Experience. The larger the screen size, the more difficult it is to maintain life like color, definition and clarity. Additionally, as the screen size increases unwanted visual motion artifacts are exposed. In order to address these concerns in larger screen sizes, an increased investment may be necessary. Therefore, choosing the right technology and video display size should be based upon room size and viewing distances, exposure to natural light, performance expectations and budget allowances. 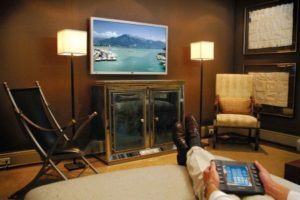 Once the criteria has been gathered, Gramophone Home Theater will present you with TV and/or projector and screen options that will closely reproduce your desired Visual Home Theater Experience. * In order to achieve maximum picture quality from your new video display device it should be professionally set-up and calibrated. During this stage we will evaluate your home theater space. This includes room size and shape (cubic area), location of the primary seating and general acoustical room elements (flooring and/or carpeting, draperies, furniture finishes and wall and ceiling surfaces). Once the evaluation is complete we will present you with several options. These selections represent the industries latest technologies and best values. Although 5.1 surround systems (5- speakers and 1-subwwoofer) have been the standard for years, newer Dolby Atmos Cinema systems can reach up to 11.2 (11-speakers and 2-subwoofers). These speaker systems come in a variety of design styles and performance levels and may include bookshelf and floor standing, on or in wall and on or in ceiling speakers and subwoofers. 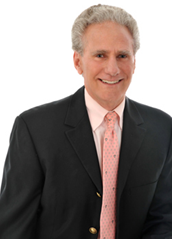 Our recommendations will take into consideration established industry guidelines and our 40 plus years of designing and installing home theaters. Based on our experience, we believe that front, center and surround speakers should be timber matched and properly positioned. Subwoofers can be concealed if properly placed in cabinetry, walls or camouflaged by room décor as long as it doesn’t affect their overall performance. These recommended speaker system options, when properly placed and/or installed, will be capable of delivering your desired Home Theater Surround Experience. * Maximum performance from any home theater speaker system can only be achieved if the home theater environment has been professionally equalized for that system. Your selection will include a preamp/processor, multi-channel amplifier and 4K Blu-ray player and/or digital video hard drive that will integrate with, complement and enhance the performance of the other elements of your home theater system. 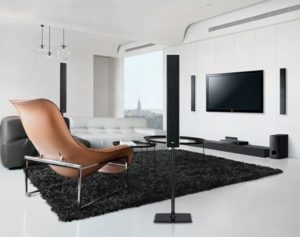 Calling upon our extensive knowledge and expertise and following current industry standards and guidelines and based upon your requirements, we will present you with a number of audio and video component choices that will harmonize with your previous selections in order to deliver your Desired Home Theater Experience. * In order to achieve maximum integration of your home theater system your preamp/processor should be programmed and calibrated to complement and enhance the performance of your TV and home theater surround speaker system and subwoofer(s).